Joint pain is a symptom that women commonly experience - about twice as commonly as men do. While it may be linked to aging and general wear-and-tear on the body, hormonal fluctuations during menopause can also cause or exacerbate joint soreness and pain. Both a deficiency of estrogen and an excess of cortisol - the stress hormone - can produce inflammation in the joints. Because hormonal imbalance is the underlying cause, menopausal joint pain can easily be treated with many methods. Continue reading to learn about the three combinable approaches to managing joint pain. Women seeking to ease joint pain have three approaches to consider. These are categorized as: (1) Lifestyle Changes, (2) Alternative Medicine, and (3) Medications and Therapy. In general, it is recommended that women start with the least risky and least invasive approach - lifestyle changes - before moving to the next tier. Medications and physical therapy are typically resorted to only in severe cases or when all other options have been exhausted. The first tier of treatment poses virtually no risk, but it requires the most self-discipline. To relieve joint pain and lead a healthier lifestyle, making minor adjustments in daily habits is the first step. Other menopause symptoms may increase stress, which can in turn aggravate joint pain. Therefore, lifestyle changes are a holistic way to reduce all symptoms of menopause and lead a healthier life. First, modifying one's diet may be necessary to enrich it with nutrients that help fight joint pain. Antioxidants like vitamin C and omega-3 fatty acids - found in berries and coldwater fish, respectively - are good for reducing pain and inflammation. In addition, calcium helps maintain healthy bones, which in turn reduces the risk of joint pain. Dairy products are rich in calcium, and for the lactose intolerant, alternatives like soymilk and fortified orange juice are available. Although joint pain may discourage physical activity, regular exercise is necessary to keep joints in working order. Low-impact exercises are the best choice in order not to put too much pressure on the joints. Overall, exercise can keep joints flexible and provide other health benefits. It is best to talk to a doctor before beginning an exercise routine to see which activities are suitable. Finally, it is important to maintain healthy habits. Smoking tobacco can negatively impact bones and increase inflammation, so it should be avoided as much as possible. Using hot or cold compresses in 20-minute intervals can also help to ease pain. In addition, lowering stress and identifying effective ways to diffuse stressors can contribute to the reduction of inflammation. Lifestyle changes are a healthy way to manage joint pain and improve wellness, but they can be hard to put into practice, and not all methods treat joint pain at the common source - hormonal imbalance. Fortunately, alternative medicines present an effective way to balance hormones. Keep reading to learn more about natural treatments for joint pain. This approach consists of various potential treatment methods. 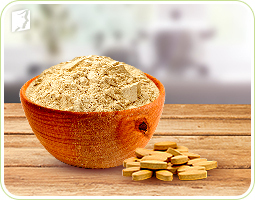 Though all of them are viable, herbal supplements are the most prominent, since they are easy to keep up with, less expensive compared to other alternative options, and they can also treat hormone imbalance directly. In terms of herbal supplements, two distinct types can be used to balance hormone levels: (1) phytoestrogenic and (2) hormone-regulating supplements. These supplements are rich in phytoestrogens - plant-based compounds that work like estrogen in the body - so they can compensate for an estrogen deficiency. However, they should not be used for a prolonged time, since long-term use of these supplements can lower the body's ability to produce natural hormones, ultimately resulting in a decline. They are typically used for short-term symptom management. These supplements, instead of containing hormones, benefit the endocrine system by providing the hormonal glands with the nutrients they need to produce hormones efficiently. This creates a balance of not only estrogen, but also of other hormones like cortisol. In addition, because these supplements do not introduce external hormones into the body, they are safe and can be taken as long as necessary. "Macafem nutrients help restore natural hormones in women. Unlike hormone drugs, which are basically resumed in taking synthetic hormones, Macafem acts totally different in your body. It nourishes and stimulates your own natural hormone production, by inducing the optimal functioning of the endocrine glands." Click on the following link to learn more about Macafem and how it works. The most effective form of treatment is typically a combination of approaches, especially lifestyle changes complemented by herbal supplements. However, when joint pain is severe and interferes with daily life, medical treatment may be called for. It is important to be aware of the risks and benefits before opting for this approach. Chronic joint pain may damage the joints and reduce a person's mobility. In such cases, physical therapy may be recommended to rehabilitate the ailing joint or joints. While this requires several sessions and requires effort and cooperation from the patient, it is one of the most direct and effective ways to treat joint pain. Medications used to treat joint pain depend on the type of joint pain. Anti-inflammatory drugs are used to relieve inflammation. Aceteminophen (Tylenol) may help the soreness feel better. Nonsteroidal anti-inflammatory drugs (NSAIDS) such as ibuprofen or naproxen may help relieve pain and swelling. 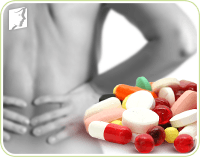 Talk to your doctor before taking aspirin or NSAIDs such as ibuprofen if you are suffering from digestive problems. If these must be taken, try deglycyrrhizinated licorice (DGL), as this will at least aid the protection of the digestive system. In recent years, the most common medication for menopausal joint pain has been hormone replacement therapy or HRT. While this can be a fast and powerful way to manage joint pain, it also poses the risk of severe adverse side effects, as revealed in the study below. In 1991, the National Institutes of Health launched a new study to research the pros and cons of HRT, the Women's Health Initiative. However, it was halted 11 years later, at which point it was discovered that the use of artificial hormones increases the risk of breast cancer, ovarian cancer, heart disease, and stroke. Other medications are also available to treat joint pain. For example, topical creams can be applied directly to sore joints, or a doctor may inject steroid medications into the affected joints to relieve inflammation. However, both options may carry side effects, so it is essential to consult a doctor to determine the best individualized treatment plan. The three approaches to treating joint pain are not mutually exclusive; they can be used as necessary to treat symptoms. In fact, many women find that a combination of lifestyle adjustments and alternative medicine provide the most relief from joint pain. Nourishes the endocrine system to support steady hormone production. Click on the following link to find out more about what is Macafem. Most topical creams for arthritis and joint pain can be used in abundance, as and when required for menopausal women.Having said this, if you suffer from sensitive skin or allergies, you should be sure to check all the ingredients of the product before use. Joint pain, whether arthritic or non-arthritic, can be a bear to live with. While you may want to heavily medicate and lay on the couch, exercising is the best thing you could do. Low-impact activities like yoga, will keep the oxygen flowing in your body and reduce the stress build-up that can cause arthritic flares. Joint pain is a complaint that many people are familiar. However, joint pain may increase during the menopause transition. Click the following link to learn about the causes of joint pain, as well as types of herbal treatments that can help alleviate or treat the pain.